Church History - One Week at A Time: Motion passed... unanimously! I use a Bible study program on my laptop called E-Sword. It’s a free program that lets me access dozen’s of translations of the Bible as well as commentaries, dictionaries on other aids. I love this program and use it often; there’s even a condensed version for my PocketPC. In 1604 however, there was not as much choice. The vast majority of Bibles were printed in Latin and unreadable by many. There were a few English translations, but most were written by people with a heavy agenda and contained many errors, some put there deliberately to promote a particular theological bent. 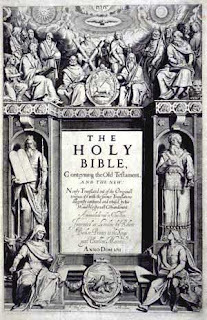 To the newly crowned King James I of England, the Geneva Bible was one such translation. It had been created by a group of reformers in Geneva, Switzerland led by William Whittingham, the brother-in-law of French theologian John Calvin, and many of the margin notes were taken from Calvin’s own commentaries on the scriptures. It was the margin notes that bothered King James the most. You see, Calvin did not subscribe to the concept of divine right of kings, the notion that since the Bible says all earthly authority is put there by God then kings rule by God’s doing and are in the right, even when they behave badly. The margin notes in the Geneva Bible, which had been around for about 40 years and was the most popular Bible of the day, made mention of how kings had to obey the scriptures and be held accountable for their actions whenever the opportunity arose, a feature that put James off quite a bit. However; when a group of 1000 Puritan leaders presented a petition to him in 1603 it was more than he could ignore, so King James called together a group of church leaders from all over the British kingdom “...for the hearing, and for the determining, things pretended to be amiss in the Church.” They met at Hampton Court starting on January 14th, 1604. Given their extreme differences, there wasn’t very much the assemblage could agree on, except for one thing; political commentary and theological opinion did not belong in the Bible. So, when Dr. John Rainolds (Reynolds), President of Corpus Christi College, Oxford, proposed " . . . that there might bee a newe translation of the Bible, as consonant as can be to the original Hebrew and Greek", James jumped onto the project with both feet. The motion was passed unanimously. Forty-seven of England's top Bible scholars, both Anglicans and Puritans, were appointed to do the work. King James himself organized the task. The translators were counted off into six panels (three Old Testament, two New Testament, one Apocrypha). The idea was to stay as close to the Bishop’s Bible as accuracy would allow, but to take into account earlier versions. In the end, about 70% of the wording would come from William Tyndale’s translation. By 1611, the translation was complete, and because James was so closely involved with the work, it is often called the "Authorized Version" or the "King James Version". In time it became the most beloved English translation. Even today many consider it the most noble translation because of the powerful use of Jacobean English in its phrasing and poetry. But it all started with John Reynold's motion, passed at Hampton Court on January 16, 1604 - 403 years ago this week. January 15, 345: (traditional date) Paul of Thebes dies. Although his parents left him a large inheritance, he abandoned it and fled into the desert around the year 250 to escape the bloody persecution of Christians raging at that time. After walking for several days, he found an isolated cave with a large palm tree and a spring of fresh water nearby. Settling here in solitude, he gave himself up to constant prayer. For this reason he is traditionally considered the first Christian hermit and an inspiration for Antony of Egypt. January 17, 356: (traditional date) Eleven years later and in the same week, Antony of Egypt, regarded as the founder of Christian monasticism, dies at age 105. Committed to a life of solitude and absolute poverty, he took two companions with him into the desert when he knew his death was near. They were ordered to bury him without a marker so that his body would never become an object of reverence. January 18, 1562: The counter-reformation Council of Trent reconvenes after a 10-year break caused by the revolt of Protestant princes against Emperor Charles V. During the break, all hope of reconciliation between Catholics and Protestants had vanished. January 19, 1086: Canute the Great, king of Denmark, is killed in church by his own subjects while celebrating mass. Denmark was nominally Christian when Canute became king, but he decided there was a need to revitalize the faith. To do this he built and restored churches and monasteries and created laws protecting the clergy. However, his "new order" also included innovations like higher taxes and mandatory tithes. This eventually led to a revolt and the interuption of that mass in January. He was declared a martyr and saint in 1101. January 20, 1569: Miles Coverdale, publisher of the first printed English Bible and the man who completed William Tyndale's translation of the Old Testament, dies at age 81.